Including ski and snowboard insurance! Before coming to Japan make sure you have travel insurance already in place. Skiing and snowboarding are inherently dangerous sports and the injury rate is high. Most ski resorts are by nature in mountainous regions in small villages a long distance from any major citites or hospitals. Evacuation can be a very expensive exercise. For serious injuries requiring major operations most people do prefer to fly home for the operation, which may require medical staff to be onboard with you. Not cheap. Many travel insurances don’t cover snowsport activities. 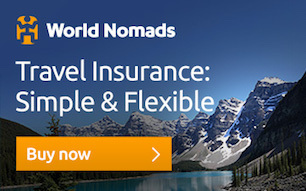 We have partnered with World Nomads Insurance to provide you with a very affordable ski/snowboard insurance for Japan, which also covers you for emergency medical treatment, emergency evacuation and repatriation as well as insurance for your stolen goods and unavoidable cancellation of your trip. • Backed by specialist insurers and global assistance partners • Buy, extend & online even if you have begun your travels • Claim whilst still travelling. No need to wait till you get back home. • Covers a range of adventure sports and activities , not just skiing and boarding.